I confess, I have had issues with the Pledge of Allegiance. What other free country makes their children recite a loyalty oath every day? The only similar images I’ve seen are in poverty-stricken dictator-led countries where kids recite to a picture of the Beloved Leader. It is state law in Utah that students recite the pledge daily. My lack of enthusiasm comes from 24 years of nagging adolescents to their feet and dragging them through the pledge. Nagging and dragging are not inspirational to anyone and even after raising two great kids, I only have vague ideas about how to explicitly teach reverence and respect. And there is a huge difference between our pledge and North Korean loyalty chants. It is in the language of the pledge itself. “We pledge allegiance to the flag . . . and to the republic for which it stands.” We pledge allegiance to each other and our freedoms. Similarly, people who are in the military or elected to office swear to uphold the constitution. 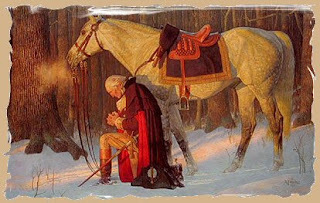 No one is asked to swear loyalty to an individual leader or political philosophy, but to our country and its founding principles. Those principles are especially important to me because, like many of my students, I am a first generation American. Kind of. I have an ancestor on my Mother’s side who came over on the Mayflower. But my dad moved here from Germany in 1949. Because he was only six years old, Dad became American almost instantly, so I’m really half-second-generation-American. What that means is I was raised with a high appreciation of our country. That comes with sad stories from the old country, which my grandparents and other relatives told in abundance. They grew up in the Depression and were young parents during World War II—3 small children by the end of the war with one more on the way. They were bombed out of their apartment building in Hamburg and became refuges for a while. But they were not refugees when they came to America. In fact, they had gone home and reunited with friends and family. A garden shelter was rebuilt into a little house. Grandpa had a good job—a job that would have given him more money and prestige than he could ever have as an immigrant with a thick accent. But my grandparents always dreamed of America. 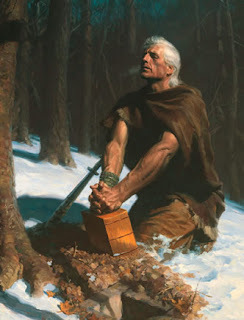 As Mormons, we believe that America is the promised land. There is no way to separate religion from our patriotism. InThe Book of Mormon, Nephi prophecies that the Spirit of God will inspire many people to come here. Grandma and Grandpa felt that spirit. They also wanted their family to go to the temple together. Today there are at least two temples in Germany, in those days they would need to travel a long distance anyway. Why not go to the land of promise? I am grateful to my brave ancestors who were willing to sacrifice for their children and grandchildren and I am grateful for this great country that inspired them. 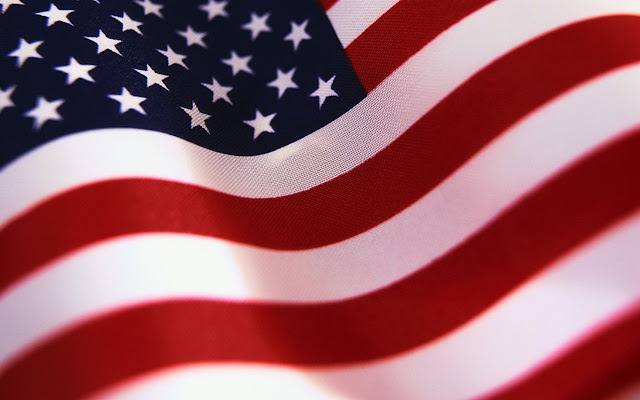 During this troubled time and ugly election season, we need to remember that this is our promised land and that all of us have pledged, over and over, to stand by our country and its ideals. 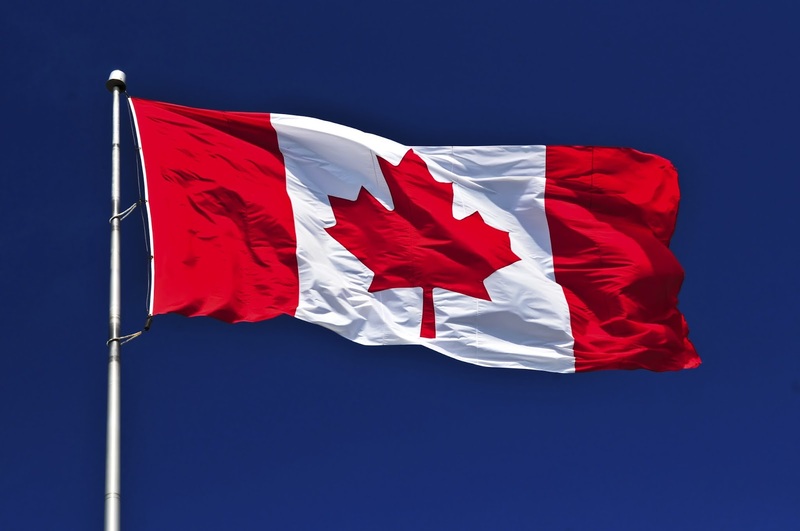 Mittens are a good symbol for Canada because they represent the reason they don’t need a wall to keep out hordes of unhappy Americans. Winter. Cold, dark, real, WINTER. Those of us who wear shorts in January or don’t bother with coats are not equipped for Canada. I’m currently not equipped for my own air conditioner. Right now I am typing in the fingerless mitts knit for Canada Day. 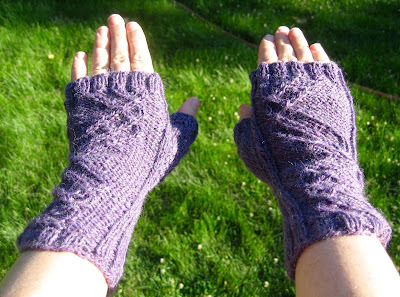 I bought a kit for these mitts during a shopping tangent at the beginning of the year. They must have been on sale, because I hate the way they look in the sales photograph. The apple green is good for showing the stitches, but it doesn’t move me. The purple heather wool I chose for my order, however, is gorgeous, which almost compensates for the trouble they were to knit. This was tight, picky knitting that required reading a pattern for almost every row. I proved to myself that I can still follow a knitting chart, but I struggled. I struggled enough that these mittens are not quite alike enough to sell. One of my lucky friends or family members will be gifted them at Christmas time (unless I decide to keep them). 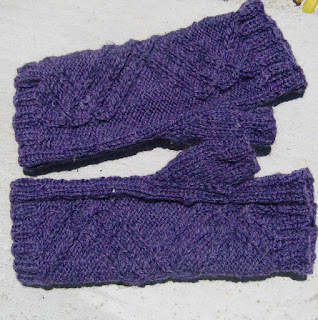 I am attempting to get two matching mitts of my own design and some mittens ready by the end of the month. If you are not preparing for winter yet, how about some wash cloths? Hand-knit cotton dish cloths are wonderful for the bath or for the dishes. I usually stick some in with my wedding gifts, and I always make more for my kitchen. 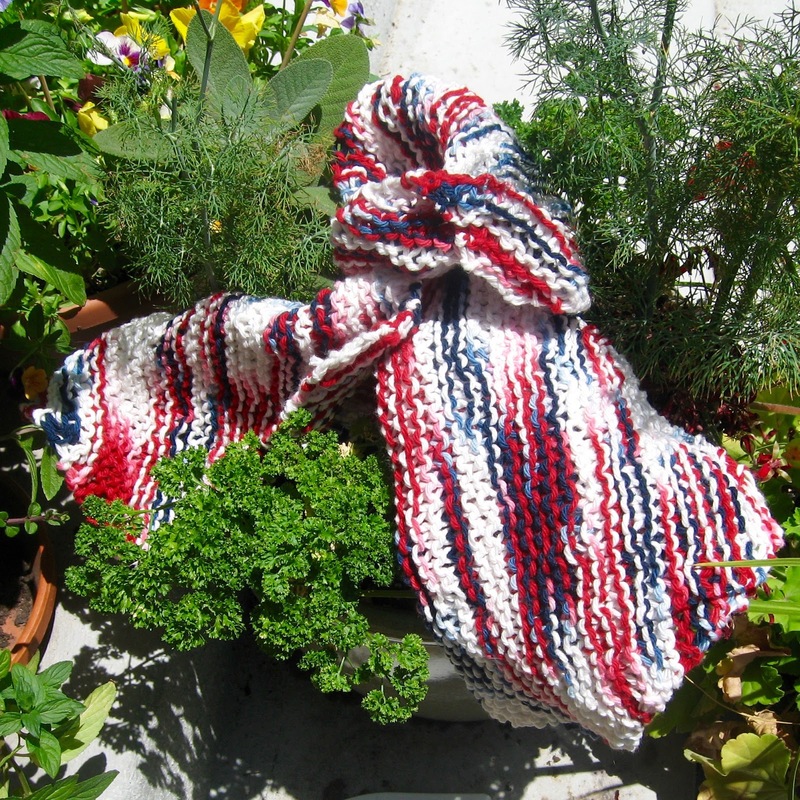 Washcloths are the perfect choice for knitting on a bad brain day or in the dark. They are also a good way to cleanse the pallet after a tough project. 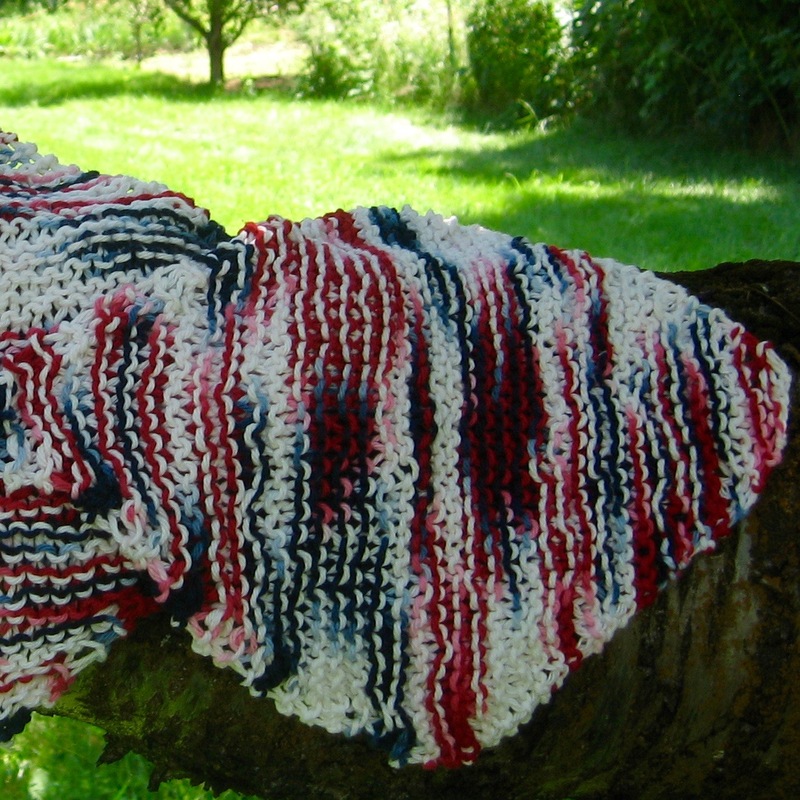 It takes me about 2 hours to knit one, so I am listing them as made to order. 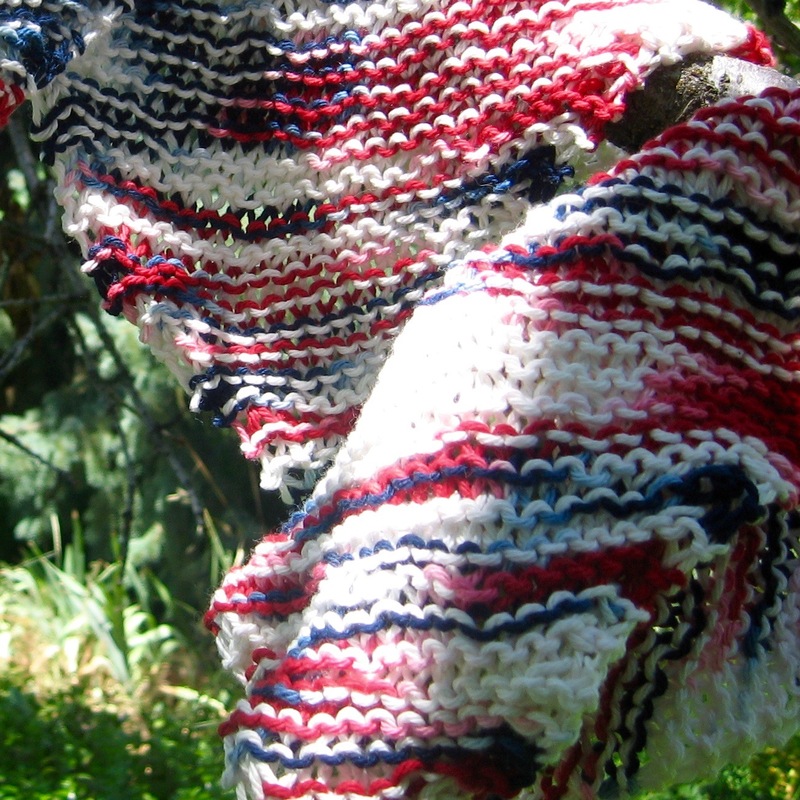 I do have a lot of red white and blue cotton, but I can work with other colors or dye-free organic cotton on request. I will be selling them in sets of three for $15 in my shop. Looking Good: Do I Want to?